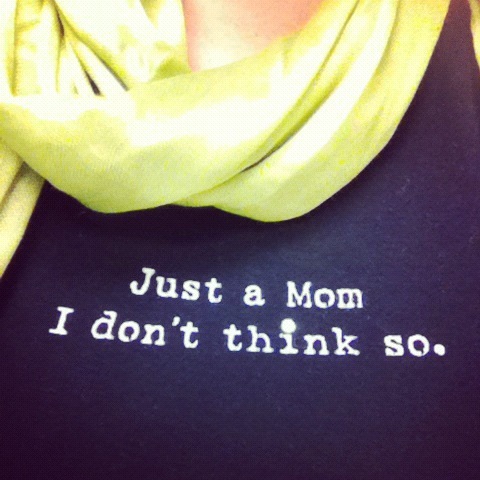 From Meredith to Mommy: "Just a Mom"
No, it's not that I'm just a mom and nothing else. Trust me, I know that's not true! A very sweet friend of mine Facebook messaged me last week. She's read my blog since I started writing it almost three months ago (my blog has almost moved from newborn to infant!). I was thrilled to hear how much she could relate and how much she enjoyed reading it. I was so overwhelmed with happiness. I had no idea she was even reading it, much less enjoying it so much! Then she told me she is a member of Circle of Moms. She knew they had a blogger program, because she would read various blogs from time to time. She also reads a few blogs that had badges proudly display a "Circle of Moms Top 25 ________ Blogger". She decided that MY little newborn blog should be nominated (she is a REALLY good friend - although she told me she did NOT want my prize of a public shout out). I was very excited. I'm really enjoying writing, and I've been researching how to reach a larger audience...maybe even blogging for a bigger site (like BlogHer or Cafe Mom or Parenting or something like that). Well, that joy was short lived, because in her next sentence she told me she couldn't. Voting opens and closes quickly and my blog didn't qualify because the only open category to nominate was Food Allergy Moms (which thankfully, I am not). So she looked at the other categories they had, which weren't currently open. And she informed me that she wouldn't be able to nominate me after all. Because they were all really specific (Coupon Mom, Homeschooling Mom, Teacher Mom, Mom of Multiples, etc) and I was "just a mom". I guess it's true. I don't, and my blog doesn't, fit into one little box that can be neatly voted on. I'm not exceptionally funny. I don't make my blog spiritual. I don't tell you how to coupon, organize your home, craft, or cook. I'm not from a major geographical area (New York, San Francisco, Australia, Canada). Leap Day Mom - that's right...Reagan will be forever young. Her choice...she was almost born in our car 13 minutes before midnight on February 29. I would have loved it if she'd given me another couple of minutes...at least time to make it into a labor room. We looked back...she was born six minutes after we made it to the hospital. Neutopenia Mom - I know more about a CBC with differential and what the different white cell counts mean than anyone not in the medical profession should have to. I'm the mom who had to give her daughter injections and be completely paranoid about bacterial infections. Stay at Home Mom - Um, yeah. That's sort of my focus of this blog. That's a subcategory for sure, but too broad for Circle of Moms. Natural birth mom (unintentional!) - Thanks to Reagan and her speedy arrival. I am a champion of the epidural and will totally opt in if there is a major cosmic shift that causes me to want to have a third child. But I can proudly say I've gone through labor unmedicated. (Former) teacher mom - There IS a category for teacher moms. But I'm definitely a full time stay at home mom right now, so that didn't apply. However, having been a teacher definitely gives me that little edge to try everything I can to avoid being THAT mom. Wannabe overachiever mom - I wrote a whole post on this one! Wannabe couponing mom - Adam already thinks I'm insane and all I do is subscribe to one Sunday paper and print some coupons off the internet. But since I'm not working, I like the idea of saving us money. So every Friday night I come home and tell him how much I spent and how much I saved. I'm dying to break the 50% mark, but since I refuse point blank to buy anything we don't need, and I buy produce and meat, I don't see it happening. That's just a LITTLE bit of who I am...and I know that I'm even more. Yes, my blog is sort of all over the map. It's about me and my girls. I don't try teach, I just write about my life, hopefully in a way people can relate to, so we find a connection. By the way, she wrote to me again and told me she did nominate me because a category opened up. I actually had to nominate myself and write a little blurb because it required a lot of information she didn't have. The category is Top 25 Home Management Blogs. I don't know that I totally fit what they're looking for, but some "general mommy bloggers" were there, so she encouraged me to go for it. If nothing else, maybe some moms will read and find an internet friend in me. NO PRESSURE...but if you want to vote for me, the link is Top 25 Home Managment Blogs. I added my badge to my sidebar. Thanks for reading! Even if you didn't, I'd keep writing, but it's nice to know people are out there, enjoying my anecdotes and relating to me!